This large paved courtyard adjoining the Palace paddocks and stables is the staging area for any mounted contingent of the guard before they head out of the city for outlying patrols. It has also become an impromptu concert area for practicing bards, who prefer it to their chilly quarters at New Olamn (C72). The mountain on which the city is built is a bald, rough crag with a peak some 1,500 feet above sea level. A lookout tower and griffon-steed eyrie sit atop this mountain. On its seaward flanks are emplaced eleven gigantic triple-catapults for hurling loads of rock and burning material out to sea against attacking ships. Several sea caves pierce the base of its western flank, connecting it to Undermountain and various points under the city by tunnels of great antiquity (once used for smuggling). The City Guard now watches these sea caves, allowing the Lords to use them for secretive operations. 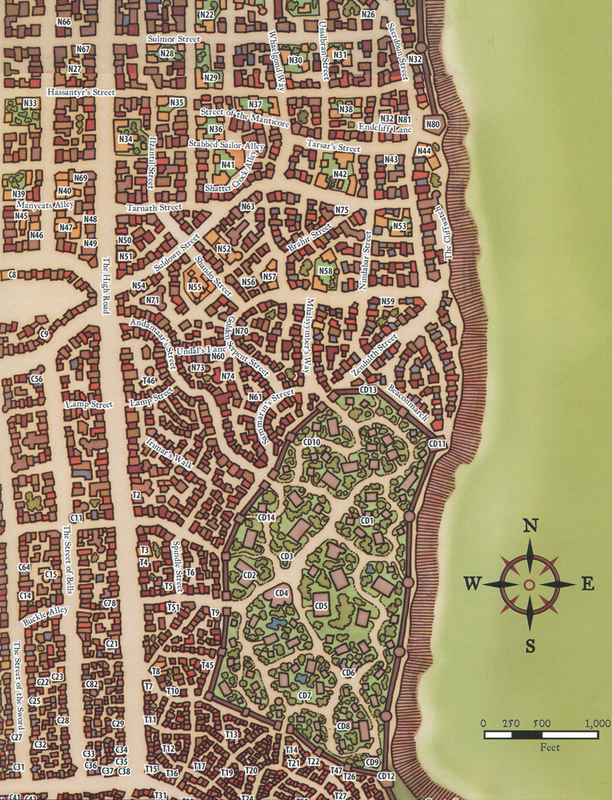 The South Seacave is connected by a set of hoists down into the mountain to the River Sargauth and Skullport. The ground on which the Cynosure was built falls within Myrkul's Ruins, so named for the brown murk that settled on the area after Myrkul's disintegration during the Time of Troubles. Although the Watchful Order of Magists & Protectors cleaned up much of the fall-out of the destruction of the Lord of Bones, Myrkul's Ruins remain the site of a seemingly permanent planar breach, linking Faerûn to the Fugue Plane. The minor planar breach has allowed the Fugue Plane's impeded magic trait (all spells are impeded; Spellcraft DC 20 + level to cast) to leech into this area. As word of this phenomenon has spread, many powerful spellcasters have chosen to hold negotiations in the, as it is seen as relatively "neutral ground" by those skilled in the Art. There are also embassies here from many other countries and cities, although such embassies need not be located in the Palace. The most elaborate embassy in the Palace is the Silverymoon Embassy, with a portal to Alustriel's Court. Piergeiron's lodgings occupy the two northern towers of the northern wing of the Palace. Also in the northern wing are various guest quarters for visiting dignitaries without a separate embassy in the city. Secret tunnels run from Piergeiron's chambers to all the private meeting places of the Lords, including Blackstaff Tower (C6). The castle can house approximately three thousand Medium-size creatures in comfort, and three times that number if every corner is used for accommodation and storage. 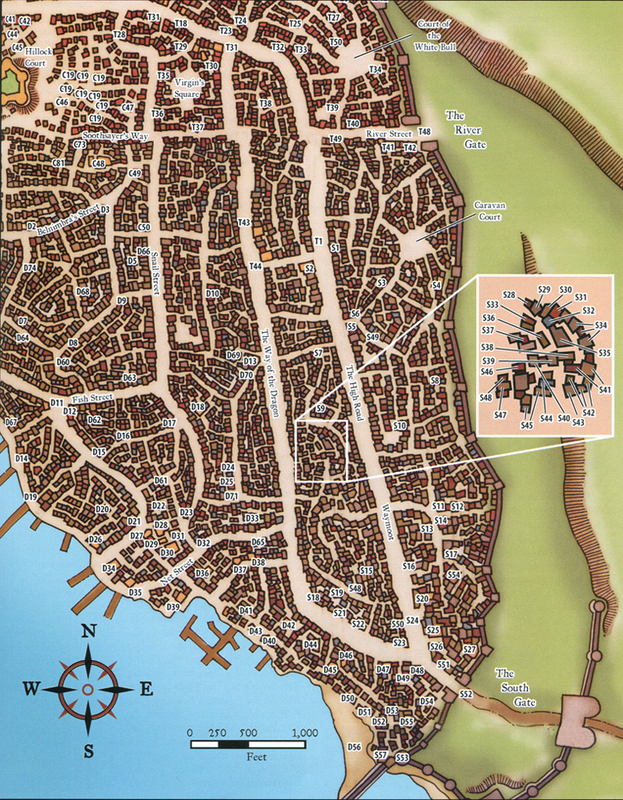 The normal garrison is fourteen hundred city guards. Dungeon levels beneath the city hold ninety cells in total, each capable of holding up to six prisoners. By edict of the Lords, the castle's larder must contain an emergency food supply large enough to feed fifty thousand people for a tenday. The castle courtyard is used for training members of the Guard and the Watch. The main stables, containing seventy or so fully trained and equipped warhorses, are located in the ground-level interior of the castle's south wall. 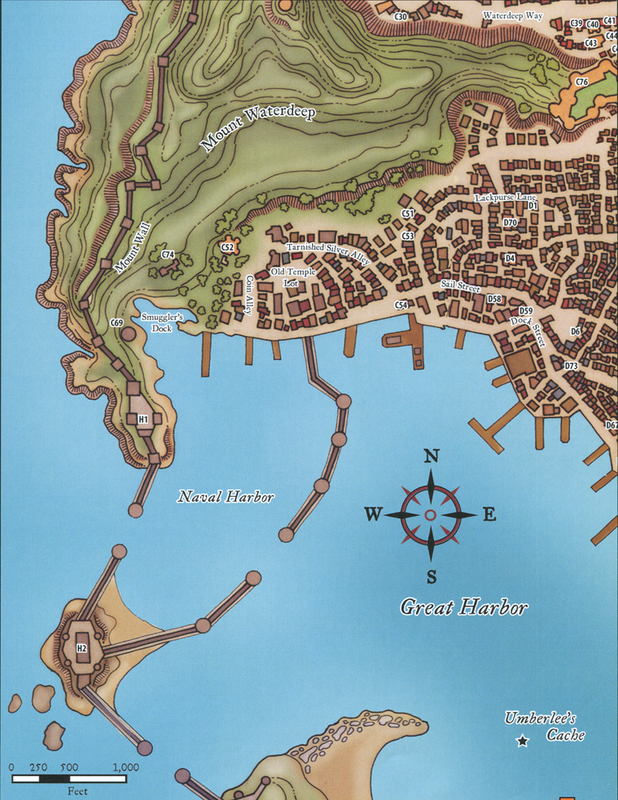 Signal beacons, horns, and mighty catapults capable of commanding the entire harbor of Waterdeep as far as Deepwater Isle and the Torchtowers are kept ready on the battlements. A garrison unit of at least thirty armed soldiers of the Guard always stands watch. The castle gates and all stations of the walls are always guarded, and just within the gates is a duty guardroom where a strike squad of twenty crossbowmen and two wizards can reinforce the guards at the gate in seconds, and anywhere else in or under the castle in minutes. 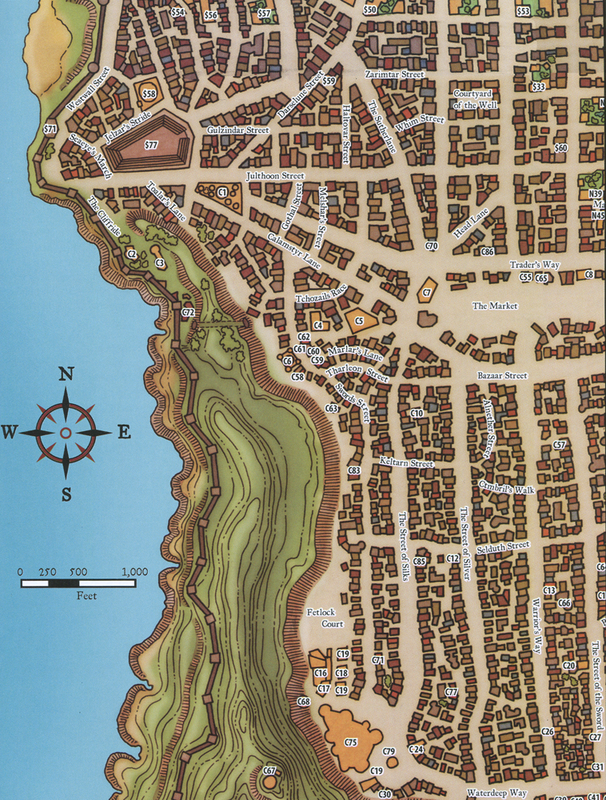 Castle Waterdeep is linked to extensive dungeons beneath the castle and in the mountain to the west, used as armories, food-stores, and to hold Waterdeep's secrets. Beneath the castle's dungeons lies the Citadel of the Bloody Hand, now a dangerous, festering sore on the castle's integrity.